If you like this free game, try Supercow. Developed by Hunter Hamster, Snail Bob, the award-winning physics puzzle game is back. This time in a new sequel, Snail Bob 2. In this puzzle game, we guide Bob safely through 90 levels each, with uniquely different traps and obstacles. This family-friendly leisure game can be easily played by kids, even from the 3rd grade. Many, including the adults, will fall in love with the humorous fantasy story of Bob. While playing this game you will find that the mouse is all that you need to control the game. Snail Bob 2 is fun, simple and entertaining. There are other similar games including bubble shooter and cut the ropes which are popular with the kids. Depending on your preference, they are available as an online game and as a downloadable game. Unlike all adventure games, Snail Bob2 has a much shorter completion time compared to similar games like bubble shooter and cut the ropes. The game can be easily fished within several hours. Playing this game requires you to complete a simple objective, level by level. Your main objective is to direct Bob towards the exit while you collect hidden stars and puzzle piece. Maximum of 3 stars and a puzzle piece can be collected. As you direct Bob towards the exit, you have to assure his safety. There will be obstacles on his path which will endanger his life. In each level, you have a total of 3 lives so guide Bob well. You begin this funny game by waking Bob from his deep slumber so that he can start his day. The comedy style game goes on a level by level completion. Disaster will strike when Bob automatically moves on its own, towards danger. To stop this automated movement, you can click on bob and he will hide in his shell. Bob only moves forward or back (x-axis). To change its direction, click on the bottom right button that shows an arrow sign. While playing this game, we must also search for hidden stars and jigsaw puzzle piece before directing Bob to the exit door. Yet, searching for the stars and jigsaw puzzle piece can be really annoying at times. They are cleverly hidden behind objects or are well blended into the background theme which makes it challenging to spot. The ones that hid behind objects will require additional interaction with an object before it is revealed. However, all these experiences become an achievement that is rather rewarding if you manage to spot them. There are three stages available. (Forest, Fantasy and Island) Individually themed, each of them has its own number of unique gameplay mechanics. The fantasy and island stages will both will escalate to a boss fight bringing an exciting element to this adorable, fantasy story gameplay. This puzzle game is relatively relaxing, not much of your brain juice is required. As you direct Bob towards the exit door, you are responsible for actions such as the opening of the gates, switching switches, even aiming and firing of weapons. Do whatever it takes to help Bob get to the exit door safely. If you played games like cut the ropes where they have quality graphics, you will find out that the 2D graphics in this online game / downloadable are similar. They are crisp and clear where all the actions of Bob are seamlessly smooth. The cartoon theme makes the game colourfully attractive. Hunter hamster always gives a huge level of importance to game design which explains why Snail Bob 2 has graphics that is so visually appealing. A large deal of this design came from a reference to pop culture. The humorous situations where Bob often ends up in never fails to bring laughter to the game. Little details like these show a high level of thought and care spent on designing the game. The carefree themed music will take you to your childhood where the world was stress-free and less complicated. Since this game is stress-free, you probably wouldn’t have any luck finding any cheat codes online. You probably wouldn’t need them anyway. However, with that said, there are always some tips and neat tricks that you can learn from to further improve your level score. Below are some tips that you might find useful. While playing snail bob, you will realise that Bob tends to moves forward automatically even when there is no obstacle right in front of him. To prevent him from getting hurt, you should stop Bob from moving immediately every time he begins a new level. This will give you sufficient time to analyse the situation of the surrounding. The good news is, there is no time limit in Snail Bob 2. Take your time and formulate your gameplan before Bob moves. In Snail Bob 2, you are only given 3 hearts (lives) to complete a level. With every death, it will cause you to lose a heart. If all the hearts are lost, you cannot advance to the next level. Yet there are always ways to go around it. 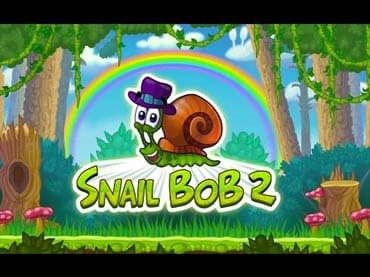 In Snail Bob 2, there is a reset button that can be used as many times as you desire. The tip here is if you realise that Bob is dying, quickly reset the button to re-attempt the level, without losing any hearts (lives). Note: this has to be done before Bob actually dies. Once Bob’s death animation appears, the reset button will be inactive. When you apply tip 1, it will buy you a lot of time for you to search for the stars. The stars will camouflage itself with the background colour. The trick here is to adopt a top-down approach when you are searching for stars. Common places include the sun, grass, shrubs, rocks, and clouds. If you still cannot find the stars, you can click on the little green icon on the top left. This will reveal all the stars in the level but it will do so only after you watch a video so do use it wisely. There are additional clothes that can be unlocked for Bob. However, all these cost money but there is a way to get them for free. When you are at the clothes shop, there is an option to watch a video then spin a wheel. The wheel will either award Bob your clothes or it will give you more hearts. This wheel has a recharger time so it cannot be used constantly. Do plan your wheel spinning time well. In conclusion, like its predecessor, Snail Bob 2 brings much joy and laughter to the players with every level injected with humorous encounters of Bob. If you are looking for a puzzle game that requires intense brain power, Snail Bob 2 may not satisfy you. However, if you are looking for a relaxing leisure game that is filled with cute comedic encounters. We would definitely recommend Snail Bob 2. This game is meant for both adults and kids. Even a kid from the 3rd grade can easily enjoy them. The completion of the whole game doesn't take you much time. Generally, the whole game can be completed within hours. A puzzle game that relieves your stress. If you have questions about Snail Bob 2 game, please contact us using this form.